Congratulations to "Mary P.", the winner in Anne Marie's giveaway. Thank you to all who participated. The title of this post might lead you to believe I recently released a novel, a story of survival that I’m hoping to promote today. Not so. Well, not totally so. It does refer to a story of survival—mine. There was no shark attack or act of Mother Nature involved. It was simply life piling stuff on to the point I thought I might break. And me trying to keep my head above water, singing “I Will Survive” in my head for months until I believed it. We’ve all been there. There are times when the universe just seems to give you more than you think you can take. And the characters from my books? They’ve definitely been in that deep, dark place where digging out seems impossible. Because I’ve put them there. What gets me (and my characters) through the tough times is hope, developing healthy coping mechanisms, and learning to trust other people enough to lean on them for help. Take a step back to reassess things. Where do I find joy in my life, and how can I maximize that while still getting things done? Am I prioritizing the wrong things with my limited time and energy? This is part of the reassessment, but more introspective. Do I need to make a change in my personal life? In my attitude? I’ve been trying to “live in gratitude” and take more time to reflect. Is it time to call in the reinforcements? Time to lean on those who love me, even when I want to do it all? Or stretch my boundaries, maybe, and join a new group. What friends help me recharge and, conversely, which commitments are a drain on my energy? This has been an important part of my “self care” these past several weeks. Walking daily (as much as possible, anyway) has been therapeutic. Plus, exercise releases endorphins, which boost mood and help reduce stress and fight depression. If nothing else, it helps me feel like I’m being productive in some arena of my life over which I have control. I’m a stress eater. When times get tough, I reach for the chocolate or wine or chips and dip. And I still do (because let’s face it, I’m human), but I try to do it in moderation. Awareness is key for me. Since I’m aware that I eat when stressed, then I’m more likely to put on my tennis shoes and go for a walk instead of indulging in an extra snack. Or I’m less likely to buy those snacks while at the grocery store. Life is short. Recent events have hammered home that concept, and I now consciously make time to enjoy each day, and to appreciate the people in my life. Deciding that the evening hours were for me, for whatever I wanted to do, rather than work or cleaning the house, was a powerful part of my re-fueling strategy. Taking a few minutes to meditate or simply breathe has been invaluable. It’s often in times of most stress that the to-do list grows exponentially. Taking a look at where I’m spending my time, and picking three things daily that I need to get done rather than tackling the whole list has been a sanity-saver. Though I love making lists—and crossing stuff off—I’m already overwhelmed, and don’t need the pressure of a list weighing on me. When everything seems dark, negative, or oppressive, it’s important to focus on the positives. A boost, however small, can really improve my outlook. I have small rewards set up, sometimes simply for “making it through the week.” A new book and an afternoon of reading time. A cup of fancy coffee from my favorite coffee shop. It doesn’t have to be expensive or involve a huge time commitment, which would stress me out even more. For now, I’m taking it one day, sometimes one hour, at a time. And I’m always open to improving my coping strategies. In fact, I’m hoping you’ll share some of your “tricks and treats” for surviving the tough times. And, in the spirit of rewarding ourselves, I recently made the first book in my Redemption Club series free. So you can pick that one up right now and treat yourself to an afternoon of romance and suspense, if you’d like. 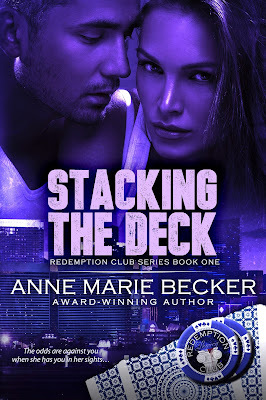 STACKING THE DECK is available at all the usual e-tailers. Or visit my website (www.AnneMarieBecker.com) for the links. What’s your favorite treat or reward? How do you splurge on yourself when you’ve done well? What tricks do you have for dealing with stress? I enjoy soothing music, a great read and some time to myself. I'm not one for splurging, but time for myself to read or knit - best reward ever. Great ideas, Mary, especially the knitting. I'd forgotten how soothing it was when I used to do oil painting or sewing. Occupying my hands with repetitive, creative activity meant my brain was free to drift and relax. Thanks for stopping by!